It all began with a fabulous Peony. I was checking out the exhibits at the New York Flower Show when I was stopped in my tracks by Paeonia ‘Largo’. It was love at first sight. As soon as I discovered that Klehm’s Nursery was the mail order source, my order went in. That was nearly 30 years ago. 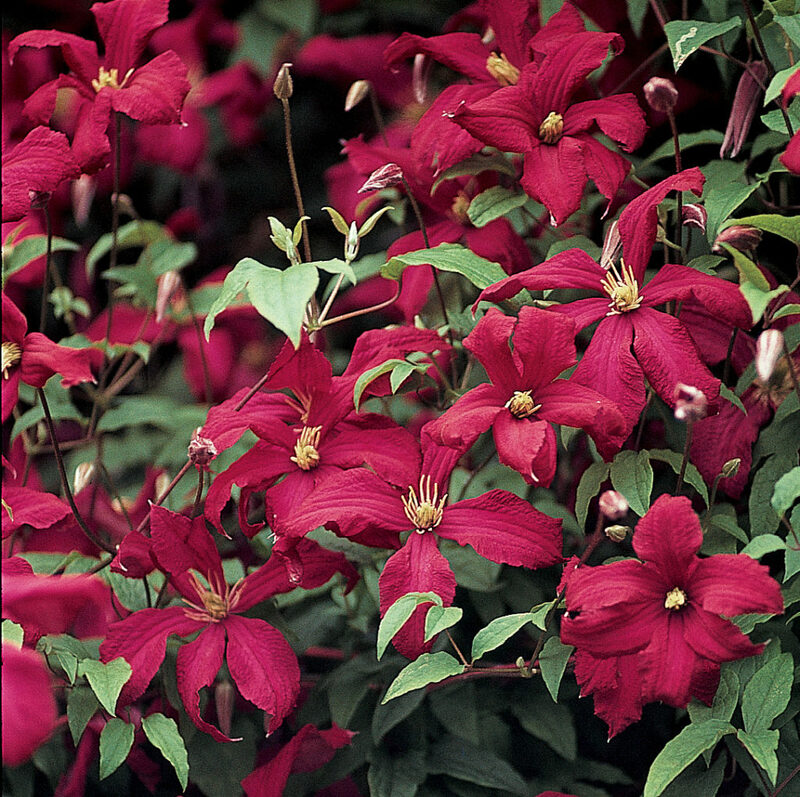 This award-winning deciduous climber produces masses of small, vibrant red flowers with contrasting yellow stamens from June to Fall. Thanks to its viticella genes, Madame Julia possesses excellent resistance to the dreaded Clematis wilt. It blooms on new growth, so hard prune to the ground in early Spring. The Clematis will attain a height of 9-12 feet. Provide fertile, moist, well-drained alkaline soil. Attracts butterflies. 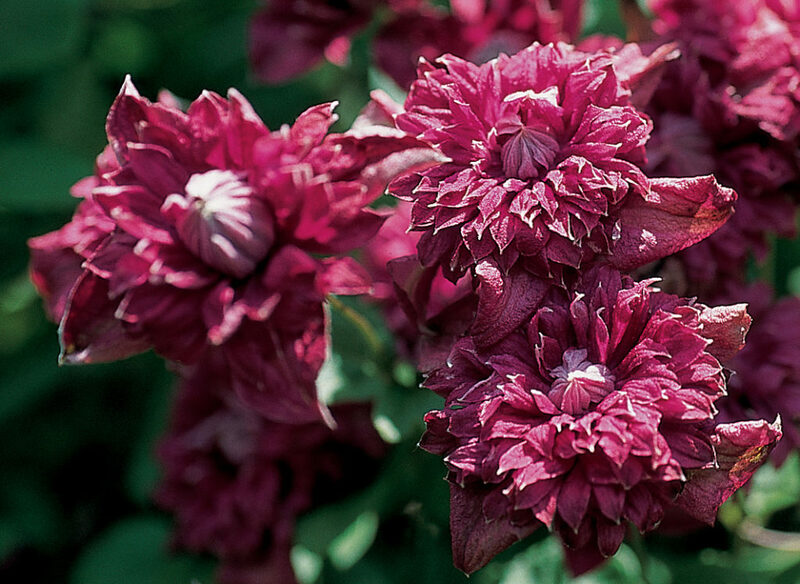 This heirloom, award-winning, distinctive Clematis is true to its name: From midsummer to midautumn it produces abundant, elegant, dark-magenta, multi-petaled flowers. Like Madame Julia and other viticellas, it is hardy, vigorous and disease-resistant. After hard-pruning in early Spring, the plant can attain a height of 10-13 feet in one growing season. Provide fertile, moist, well-drained alkaline soil. Attracts butterflies. Baptisia ‘Vanilla Cream’ (Decadence Series) Z. 4-9. 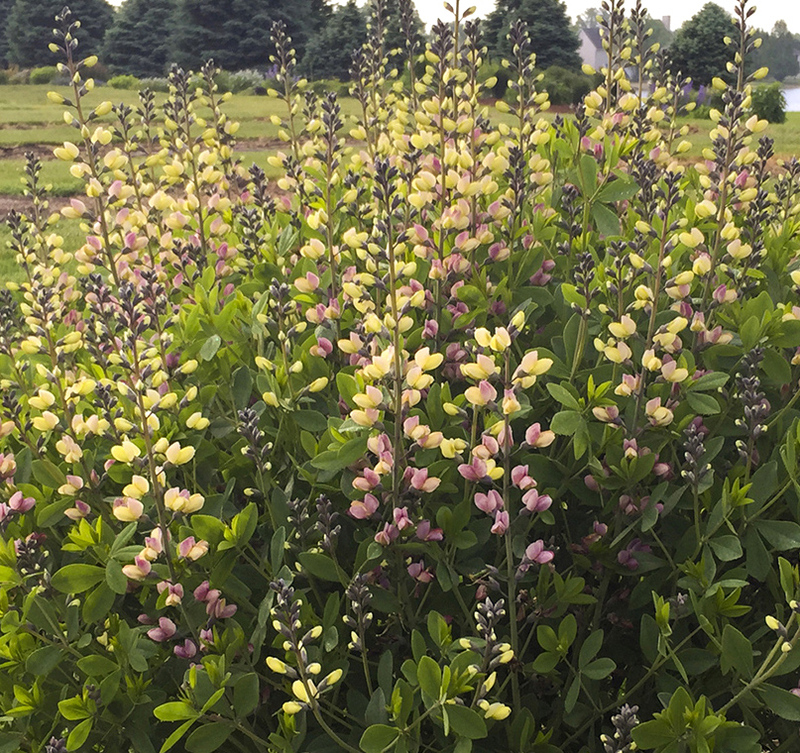 Baptisia is a tall, deer-resistant, American native perennial that attracts butterflies. It is a tough, long-lived plant that succeeds in nutrient-poor, well-drained acid soil. It is slow-growing at first because it expends considerable energy in producing a deep and extensive root system. Carefully choose the planting site: while the deep, extensive roots support a long-lived plant, successful transplanting is all but impossible. Baptisias thrive in poor soil because they are able to fix nitrogen from the atmosphere. A partnership has evolved between the plants and specialized root-colonizing bacteria. The bacteria live in nodules on the plant roots and take nitrogen from the atmosphere and turn it into a form the plant can use. As quid pro quo, the plant provides the bacteria with sugars created through photosynthesis. Pretty neat! 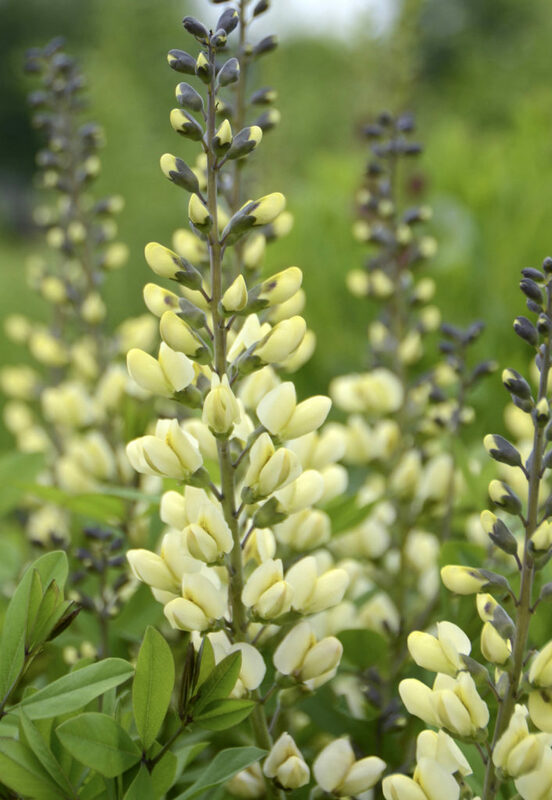 Baptisia’s natural foliage is blue-green and its flowers resemble the bloom of Lupinus and Delphinium. After flowering, the plants produce decorative seed pods that rattle when you shake them. Much like maracas. B. ‘Vanilla Cream’ is a new cultivar in the Decadence Series. It sports unique grey-green foliage and a compact size of 2.5-3 feet. Its flowers have pale yellow buds opening to showy, creamy white blossoms. Baptisia ‘Pink Lemonade’ (Decadence Deluxe Series) Z. 4-9. Plants in this Series have taller stems and exciting new flower colors. B. ‘Pink Lemonade‘ flaunts yellow flowers that mature to raspberry-purple, and both colors appear at the same time on the charcoal-colored stems. A striking display. 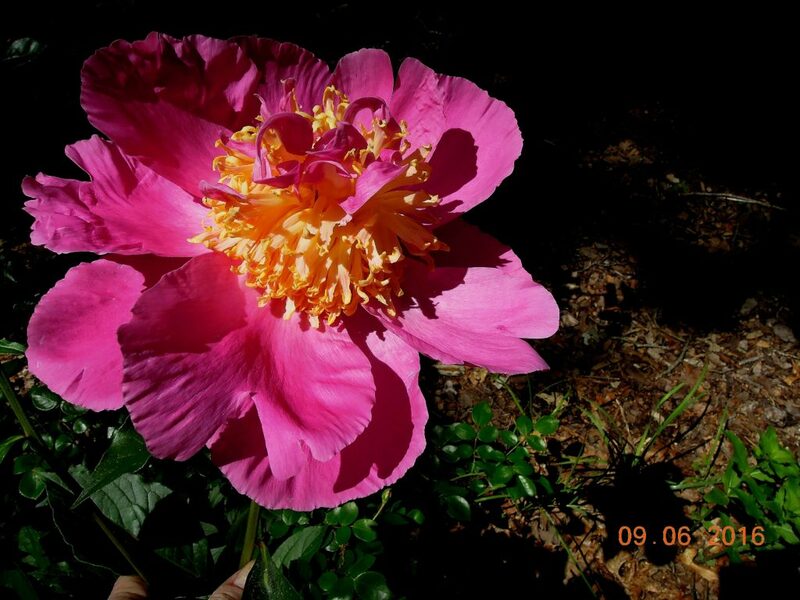 Finally, I have to end this post with a photo of Paeonia ‘Largo.’ She insisted. This entry was posted on February 26, 2019, in Autumn Fruit and Color, Native Plants, Organic Gardening, Shade Gardening. Bookmark the permalink. March 2018: Helleborus and Naming Names.